When my sister first moved to Pass-a-Grille, Florida, she wondered about the identity of the homeless guy riding his bicycle up and down Gulf Way. One day while speculating out loud, a waitress at The Hurricane finally tipped her off. “Honey. That’s no vagrant. That’s Evander.” Florida has a reputation for producing colorful characters; the state has proudly sheltered pirates, housed Ernest Hemingway and his six-toed cats, and nurtured generations of gator wrestlers. I think it’s fair to say that only Florida could produce Evander Preston, a jewelry craftsman, brewer, art collector, and chef who resembles a refugee from the Hell’s Angels. 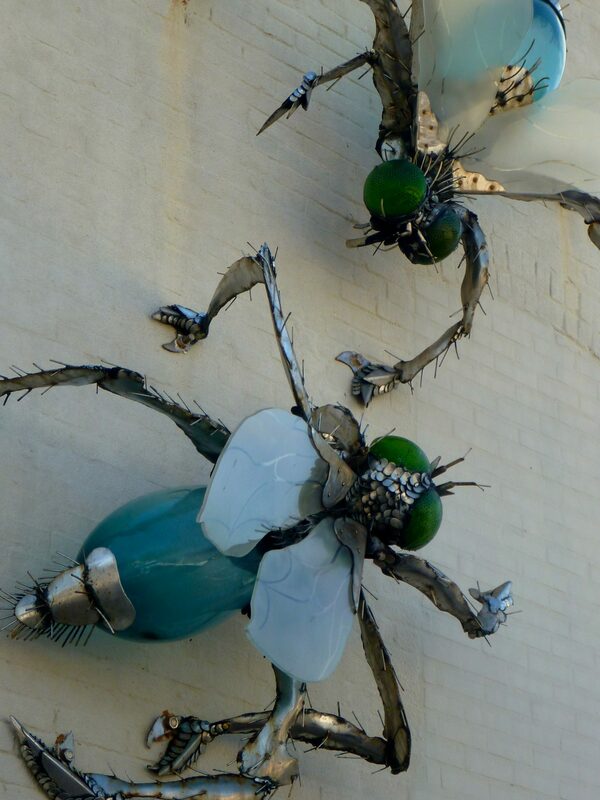 Just as you can’t help but notice Evander, you certainly can’t miss his gallery on 8th Avenue; the giant flies mounted on the exterior wall make the grandest palmetto bugs look puny. The gallery doesn’t have regular hours and I’d walked away disappointed on all of my prior trips. Holding my breath as I rang the bell, I was thrilled when the door was answered by the owner’s longtime friend Eddie St. Clair who introduced me to Heather, Mr. Preston’s daughter. She encouraged me to look around and permitted me to take pictures of the showrooms. 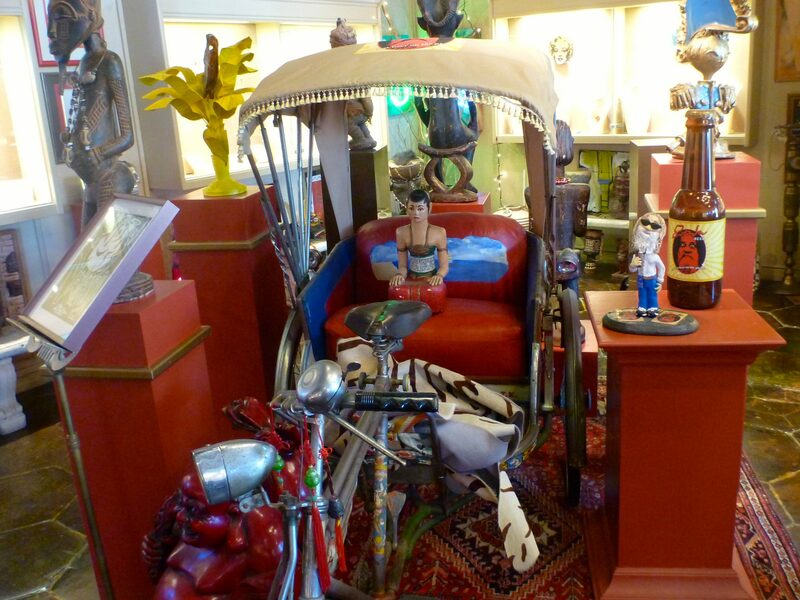 This large rickshaw occupies much of the floor space in the gallery’s Silver Room. It’s the perfect centerpiece. 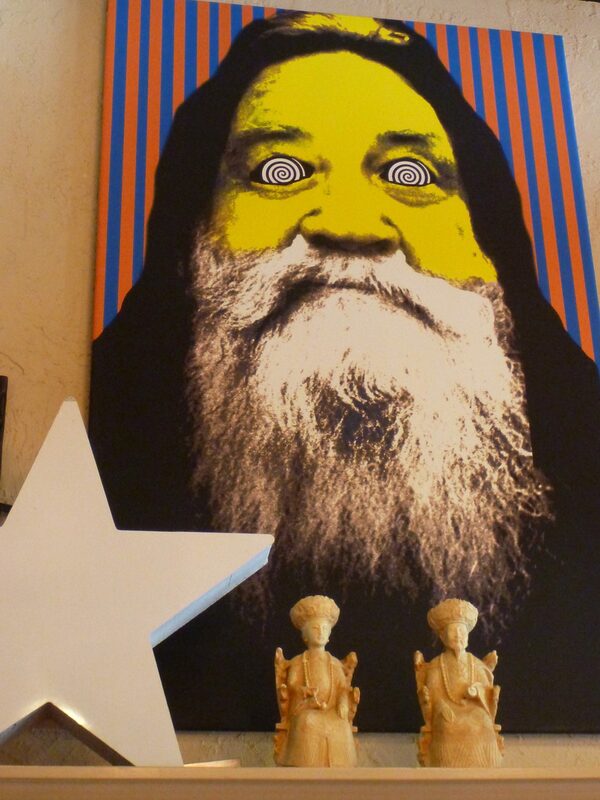 Every wall is covered with items from Mr. Preston’s extensive collection of art. In fact there’s so much stuff everywhere, you almost forget to notice the beautiful jewelry displayed in traditional illuminated cases along the walls. 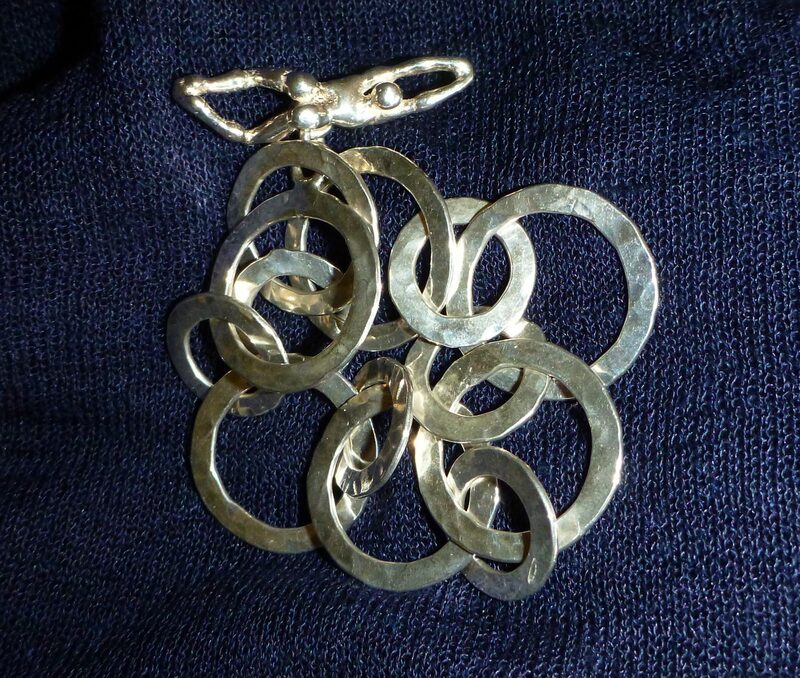 He designs in both gold and silver, much of it hammered. The pieces are bold and playful. One of his new designs is a necklace that resembles the ones we used to make out of soda pop tops. There are several areas closed off by velvet ropes. It’s reported that VIP clients (incuding Carl Reiner, Lauren Bacall and Jimmy Buffet) have access to these areas and enjoy meals prepared by the artist while they shop. 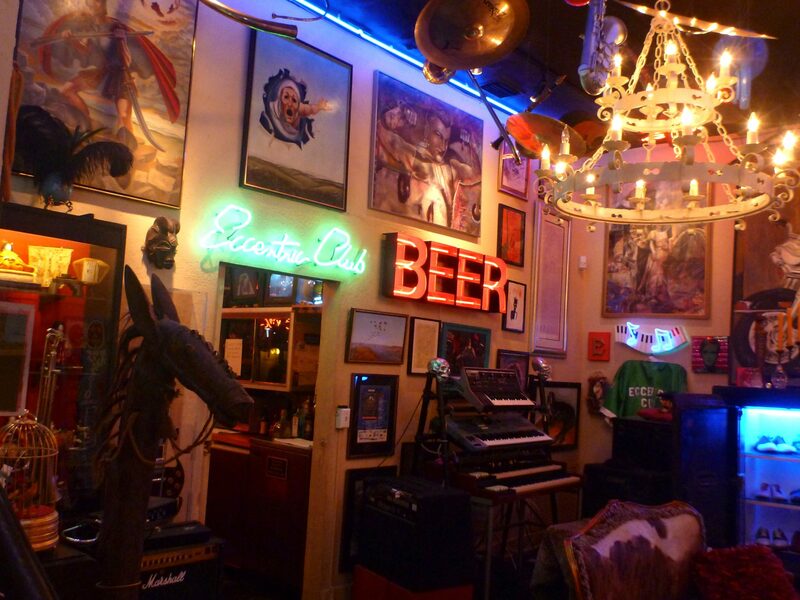 It’s a funky, fun wonderland and you can’t help but get a certain “hoppy” feeling. In addition to crafting beautiful jewelry, Mr. Preston brews Evander Beer, “the coolest beer in the world,” advertised with the outrageous tagline: “Better to be a famous drunk than an anonymous alcoholic.” It’s sold locally in bottles and on tap in several St. Pete bars. Howling like Veruca Salt in Willy Wonka, my daughter REALLY WANTED the 24k miniature train set featured in the Gold Room. Heather gently informed her that it wasn’t for sale, relieving me of the need to explain that there was no way we could afford it. What I did choose to buy was a beautiful silver bracelet with a sculpted swimmer functioning as an unusual clasp-a perfect reminder of our beach vacation. While completing my purchase, Mr. Preston materialized out of the vapor and inquired about my day. I told him I was having a blast. “If this is a blast, then you need to get out more often,” he replied dryly, smiled and retreated back into Evanderland, a most unusual roadside attraction. If you want to know more about Evander Preston, check out this great profile by Dave Norrie in What’s Hot Tampa Bay. « Where Did I Put That Boarding Pass?